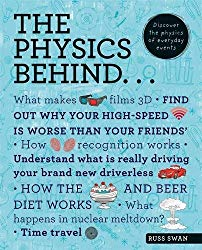 If you know only two things about Neil Armstrong, you will know that he was the first man to set foot on the moon, and that after his adventures in space he retreated to the quiet life of an engineering professor. What seems to be less widely appreciated is that, in between Armstrong the astronaut and Armstrong the recluse, there was a period of Armstrong the celebrity. He appeared on TV shows around the world, was feted by governments and universities, and perhaps surprisingly he even dabbled in a bit of product endorsement. This was how I came to meet him. I recall vividly my surprise and delight when an invitation to lunch with Neil Armstrong landed on my desk, in early 1985. I was excited at the chance to meet a boyhood hero, and a little puzzled why nobody else in the office seemed particularly interested. I suppose, in hindsight, that his cachet increased with his reclusivity. That, or I was the only really nerdy one on the staff of that magazine. It wasn’t exactly an intimate lunch. The main ballroom at the Savoy holds, I guess, a couple of thousand, and I was seated a long way from the top table. The meal, naturally, was delicious: smoked salmon, tournedos of beef, pears in Cointreau. But it was the after-dinner speech that we had all come for. Whose line was it after all? Some years later, I noticed the exact same lines being spoken by Tom Hanks (playing astronaut Jim Lovell) in the movie Apollo 13. I wonder who really said it first, and to whom. It’s possible that no astronaut ever actually said it, and that it is the creation of some Nasa PR writer. 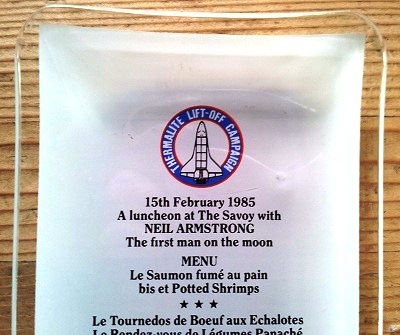 After Armstrong’s speech, we were treated to another short talk – this time by the managing director of the company that had laid on the lunch, desperately trying to link his new product to the heroic success of the Apollo programme. The banal truth of the matter is that the company in question made a product about as far away from the high tech world of the space race as it is possible to imagine: concrete blocks. The tenuous connection was that these lightweight autoclaved aerated blocks were “the fastest block off the ground”. In other words, buildings using them in their foundations would be built faster. To be grammatically correct, they should have been the fastest blocks out of the ground, but that presumably would have been even more difficult to link to Armstrong and his achievements. Nevertheless the Thermalite Lift-Off campaign played heavy on the space theme, bizarrely even using an illustration of the Space Shuttle – the then-current space vehicle, but one Armstrong never flew – in its logo. As the luncheon ended, and the majority of the people drifted away, I made my way forwards. Neil Armstrong stood at the top table, engaged in casual conversation with that MD – no doubt discussing the implications of the new building regulations on the thermal requirements for foundation masonry, or something. He quickly acknowledged me, and when I nervously asked if I could shake his hand he did not hesitate. I mumbled some drivel about him being a boyhood hero of mine – which he was – and he offered me his autograph. I later learned that he stopped signing autographs, after realising that there was quite a trade in them. I can tell you that in February 1985 at the Savoy in London, he was volunteering them. The object he signed for me was a small glass dish which had been on the table, printed with the lunch menu and meant as a keepsake. He fished a marker pen from his inside breast pocket, signed the back of my dish, and handed it back to me with a warm smile. By now a small cluster of people had gathered around us, and it was time for me to let others bask in the glory of the greatest explorer of our age. I returned to the office to write my report. Considering the trouble and expense the sponsoring company had gone to, I doubt they were very impressed. I recounted the meeting with the great man and highlighted the contrived connection with aerated concrete, pouring particular scorn on the gaggle of young female models employed to add further glamour to the occasion. I remember that my editor was particularly unhappy with my description of their skimpy silver spacesuit outfits, which I said made them look ‘oven-ready’. But this was a construction industry trade magazine and, despite my personal delight at being in the same room as the first man on the moon, it really was a crass and inappropriate marketing campaign. Being a fearless young reporter, I felt it was my duty to say so. In my foolishness, I later used that little glass dish as an ashtray. When it was full, I emptied it and then rinsed it under the tap and watched as the autograph also disappeared down the plug hole. I guess Armstrong’s marker pen was water-based. As a direct result of this, just a couple of decades later I gave up smoking altogether. 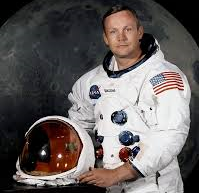 Millions of words have been written about Neil Armstrong, whose death was reported today. I feel privileged to have had this small encounter with him, one of the great names of our era, even if it was under these most unlikely of circumstances. In my experience he was not aloof, not reclusive, not haughty – but warm, generous, and friendly. And that’s just how boyhood hero should be. Fascinating to read your account of that day, Serena. I dearly wish I’d kept the invitation, press kit, etc, and I had completely forgotten about the cufflinks – but a quick search this morning and I’ve found them! There is no branding of any kind, just the Space Shuttle design etched in gold on a brushed silver surface, in a plain black box. Thanks for reminding me of them and where they came from! Hi Russ, Strange to come across your post -Yes, I was also there on that day at the Savoy-I was one of the ‘gaggle’of Girls dressed in the Silver Spacesuit- (Apparently they were specially made from a vogue pattern)I worked for Thermalite for about 3 months as part of there countrywide promotion team which was actually a PR exercise to promote the company before they floated shares. This involved driving around to chosen builders merchants where we had a ‘roulette board ‘ with a chance to get into that luncheon and meet the amazing Neil Armstrong as a prize -The disappointed got ‘Thermalite’ mugs with the space shuttle logo. I too got one of the little glass trays – mine still complete with autograph intact and treasured! Yes, Great speech- I also remember he said something about looking at the earth so small and far away and thinking about God. Very Moving . Nice to hear your account Maria, many thanks for it. Hope the ‘oven-ready’ jibe wasn’t too painful! R.